The mother of a seven-year-old girl who starved to death at her Birmingham home has been sentenced to 15 years and the girl's stepfather jailed indefinitely. Angela Gordon, 35, was cleared last month of murdering Khyra Ishaq but admitted manslaughter on the grounds of diminished responsibility. She will be jailed for seven-and-a-half years and spend the rest on licence. Gordon's partner, Junaid Abuhamza, 31, also had a manslaughter plea accepted after a report about his mental health. He must serve a minimum of seven-and-half years, the judge at Birmingham Crown Court said. Abuhamza broke down in court during sentencing. Khyra weighed 2st 9lb (16.5kg) when she was found severely emaciated at a house in Handsworth in 2008. She was taken to Birmingham Children's Hospital where she was confirmed dead. Mr Justice Roderick Evans told the pair their behaviour was "chilling in its harshness and cruelty". During the retrial, which was ordered after the first trial collapsed, jurors heard Khyra had been killed by an infection that been caused by months of deliberate starvation. The court heard how the house was well-stocked with food, but this was kept locked away out of the reach of Khyra and five other children in the care of the defendants. They were also starved, two of them suffering from dangerous malnutrition when they were rescued. 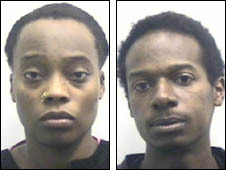 The pair earlier admitted five charges of child cruelty relating to those children. The judge said the sentences were also given for those charges. Junaid Abuhamza has schizophrenia and although he was fit to appear in court it was agreed by three psychiatrists that he will require lifelong support and monitoring. It is also agreed he could suffer a relapse in the future which would mean he would pose a risk to the public. It was because of this risk that an indeterminate sentence, called Imprisonment for Public Protection (IPP), was imposed. This means the judge set a minimum tariff that he has to serve in prison. But because of the IPP he will not be released until he is able to show he is fit and does not pose a threat to the community. He will undergo classes and intensive supervision and it is likely doctors consulted during this trial will be approached to decide if he can be released in the future. Birmingham's social services department has been criticised for not intervening in the case. But Tony Howell, strategic director for Children and Young People in Birmingham, said they cannot guarantee every child's safety. After Gordon admitted a charge of manslaughter in court last month, a High Court ruling was made public stating that "in all probability" Khyra would be alive if there had been "an adequate initial assessment by educational welfare services". In the ruling Mrs Justice King said: "It is beyond belief that, in 2008, in a bustling, energetic and modern city like Birmingham, a child of seven was withdrawn from school and thereafter kept in squalid conditions for a period of five months before finally dying of starvation." 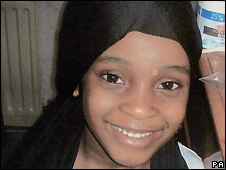 A serious case review into Khyra's death by the Birmingham Safeguarding Children Board is under way. In court on Friday, Gordon was told by the judge her cruelty was "horrific" and made worse because she was the girl's mother. The court had been told Khyra, who was removed from school in December 2007, was forced to stand outside in the cold or in front of a fan for long periods. She had cold water poured over her and was beaten with a cane. At mealtime, she and the other children were given a bowl containing carrots, beans, eggs and rice, or unsweetened porridge, to share. "It is not right to say that these children suffered from neglect," the judge said. "Neglect is an inadequate and inappropriate description of the way they were treated. "Rather, they were subjected to a domestic regime of punishment which was chilling in its harshness and cruelty. "A regime introduced by you, Abuhamza, as it had its origins in your own upbringing, but a regime to which you, Gordon, became a party." He added that he was satisfied that when Abuhamza became well enough to realise what he had done, he "felt and expressed genuine remorse". Gordon was told that she was a "caring mother" up until the end of 2007. Mr Justice Roderick Evans said he accepted she had grieved for her daughter but had only "very recently" experienced genuine remorse after being in a state of denial. Speaking after the pair were sentenced, Khyra's father, Ishaq Abu Zaire, said he acknowledged the difficulties associated with child protection but felt more could have been done to save his daughter.